Yes, this post is long. But Tiger Tales will make it incredibly worth your while if you read it through to the end! Any long time readers around here know that our family really loves Tiger Tales books. A lot. I like them so much that whenever I see that red label on a side of the book, I pick the book up, whether the title first catches my eye or not. So far as I have ever seen, they produce quality books that children love and adults don't mind reading! That takes some degree of cleverness, but they always seem to manage it. I sliced open the box and reached inside and this time my youngest child, Bookworm3 (age 2 next month!) let out a crazy squeal. This box was made for her. 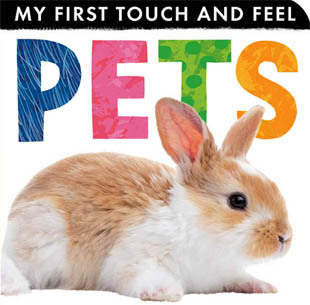 The very first title I pulled from the box was My First Touch and Feel Pets which just about sent my daughter over the moon. The front cover, you'll notice, has a bunny on it and she recently attended a magic show where a live bunny was present and she got to touch it. She hasn't stopped talking about that experience (we talk about it even more each time we sit down with this book) and now she has her very own bunny to pet anytime she wants to. 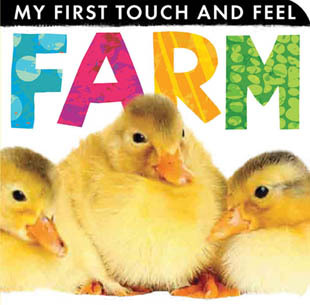 All of the above can be said about My First Touch and Feel Farm . In this book the following animals make an appearance: a duckling, foal, puppy, piglet and lamb. The lamb is our favorite animal from this book because some people who live near to us have a bunch of sheep and when we go out on evening walks, the sheep talk to us. We feel very friendly towards such creatures as a result! What makes this series stand out from other touch and feel books, you ask? It's a fair enough question! I would say that these books are more visually appealing than any other touch and feel book I've seen. I am a particular fan of their use of sharp, clear photographs of the animals featured. Instead of placing their images on colored backgrounds, Tiger Tales opted to use black and white backgrounds with primary colors for lettering which really makes things pop out at you in a different manner than other varieties of books on these subjects. These have a very bold and colorful feel, yet when you look closely at it you can see that the imagines stand out for being set against white. Yet for all that, the books also feel rich with color. 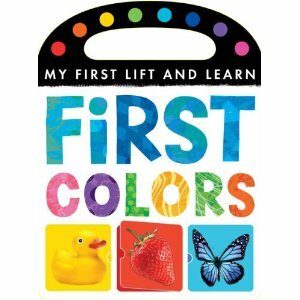 Moving on, we have My First Lift and Learn: Colors and My First Lift and Learn: Numbers . These two titles have built-in, solid handles which makes it easy for little hands to carry them around. They can handle (har, har) some degree of heavy usage. 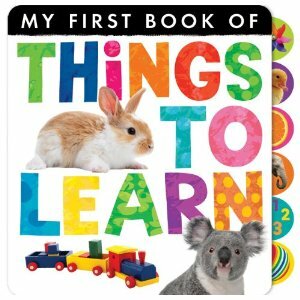 My First Book of Things to See and My First Book of Things to Learn are tabbed books. Each page can be turned to by grasping on to the rounded, colorful tab which allows little children who are learning how to manipulate pages easy access to the pictures inside. These book focus on building vocabulary and that makes me a bit fan of them. Using the same crystal clear imaging, we can learn to identify Things at School, Things at the Park, Things at the Beach, Things at the Zoo and etc. 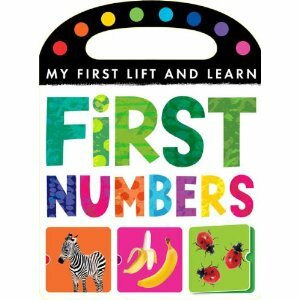 There are also pages which teach shapes, colors and numbers much like in the above titles, only using a different format. 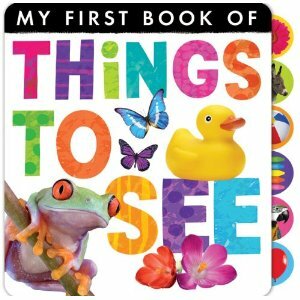 At first glance at these titles I thought there might be too many pictures on each page spread and wondered if the amount of images might be a little overwhelming to my daughter. Usually, if she is too confused by something, she just flips pages quickly and randomly but she did not seem dismissive of these books at all. Rather, she started telling me about what she thought was happening on each page. Apparently it looked like a story to her and she was very attentive and enthusiastic in telling me about the kids at the beach who were wearing their "swimming clothes" and getting into the water. 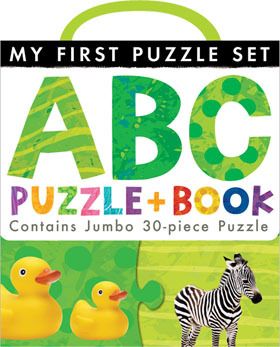 And last, but not least, is their new ABC Puzzle and Book set . This contains a paperback book (as opposed to a board book, like all of the titles above) featuring, obviously, the letters of the alphabet. Each page has one letter (so 2 letters per spread) and is surrounded by images which start with that particular letter. I thought it was interesting that they used emotions in their picture line-up. (For example: "upset" for U.) You also have likely gathered that it comes with a thirty-piece floor puzzle. The entire series is earmarked for ages 2-5. I don't know that even five years old is a bit overreaching but the alphabet and puzzle title certainly fits the bill. And despite the fact that these books are for younger children, Bookworm1 (age 6) did enjoy flipping through them with his siblings. They are bright, colorful and cheerful so why not?! Tiger Tales has offered to giveaway ALL of the above titles to one of you! Yes. That's right. One of you can win this entire new "My First" series! How can you win? Well, I like to keep things simple. All you need to do is to leave a comment below with your name and a valid e-mail address so that I can contact you if your name is selected as the winner. This contest is open to US Residents only and will be open through Friday, March 29th. THIS CONTEST IS NOW CLOSED. THE WINNER (as selected by Random.org) is #8 - Janna! Congratulations!! Thanks to Tiger Tales for their AMAZING generosity in not only sending a set of these books to my family in exchange for our honest thoughts, but for also offering up a set for one of my readers here at Reading to Know.com. And can you believe I actually shared this on FB? I did! I have a two year old and two seven-month-olds, so this would be perfect! I want to win! lol. I have a two year old nephew who would love this!! Very cute! It would be great to stick these in Christmas/Easter, etc for our new arrival this year! I just shared about them. Are you on Twitter now?? I am going to have a new nephew in August that I would love to give these books to. My toddler would love these! Baby books! Baby books! I have children's books and picture books...but no baby books! I have two young granddaughters and a grandson due in July. I would love to be considered, thank you and thank the publisher! How exciting! I would love to win this set. I think my 3 1/2 yr old would enjoy many of these, as will her brother when he's big enough. These look amazing. My boys would love them! I am officially the book gifting aunt to my nephew. Great additions these would make! OH MY GOODNESS!!!!! DROOL!! These look AMAZING! I am Tweeting and Facebooking for extra entries. I'll come back and comment that I did so. I shared this giveaway on Facebook too! Naomi loves books. Her face lights up when we sit down to read. I'd love to win these for my boys! I'll share on facebook as well!! These look so cute! I would love to give them to my nephew. I'm imagining Bookworm 3's crazy squeal! :) Firefly lets out one anytime he sees a cat. We're still enjoying all our other Tiger Tale title, so definitely enter us. *That should say "titleS" above! There is a boy here that would think those awfully fun! Wow, these are fun books! We would really enjoy them! Wow! We would really enjoy these! I love the bright colorful graphics. Great collection to encourage early reading and love of books. My daughter would LOVE these! Thanks for the opportunity to enter!